Excellence in Practice. Hall Law P.A. brings top level legal talent to the aid of real people in need of help. Our trial lawyers stand up to the corporate insurance companies and work to ensure the people of our communities get the fair treatment they deserve. Core Values. The Hall team is built on a foundation of core values that include honesty, integrity, hard-work, and doing what's right. At Hall Law, personal injury comes with dignity and respect. · $950,000.00 – Boating accident – Settlement –Minneapolis, MN – Mike Hall Sr.
· $1,000,000.00 – Hip Injury - Settlement - Minneapolis, MN – Michael Hall, III & Mike Hall Sr.
· $800,000.00 – Unsafe Stairwell - Settlement - St. Cloud, MN – Mike Hall Sr.
· $1,200,000.00 – Car accident - Settlement - St. Cloud, MN – Mike Hall Sr.
· $515,000.00 – Car accident - Verdict - Aitkin, MN – Mike Hall Sr.
· $850,000.00 – ATV accident - Settlement - Stearns County, MN – Mike Hall Sr.
· $450,000.00 – Farm accident - Settlement - Stearns County, MN – Mike Hall Sr.
· $4,670,000.00 – Gas leak & explosion settlement - St. Cloud, MN – Mike Hall Sr. Peer Recognition & Awards. As a result of diligent work representing injured people over the course of decades, firm lawyers have benefited from the recognition and respect of their peers in the legal community. Both Michael Hall, III and Mike Hall Sr. hold AV ratings from Martindale-Hubbell, the highest rating for both legal ability and professional ethics. Mike Sr. has been selected by his peers in the legal community as a "Leading Minnesota Attorney," a distinction received by less than 5% of all Minnesota lawyers. Mike Sr. has been recognized as a Minnesota SuperLawyer for well over a decade. Michael Hall, III has been repeatedly recognized as a Rising Star, a Minnesota SuperLawyer, and a Top 100 Trial Lawyer. In 2013 Michael was named one of the top 100 litigation lawyers in the state of Minnesota. This is a distinction conferred by the American Society of Legal Advocates. Selection to the top 100 is based on measures of demonstrated legal achievement. In 2014 Michael was recognized as a top 100 Trial Lawyer by the National Trial Lawyers. In 2015 Michael was named to the Nation’s Top One Percent by the National Association of Distinguished Counsel. Hall Law is open from 9 a.m. to 5 p.m., Monday through Friday. We can also meet on evenings and weekends by appointment. Free parking is available. At Hall Law we handle all manner of personal injury cases, with a focus on catastrophic injury and death cases. 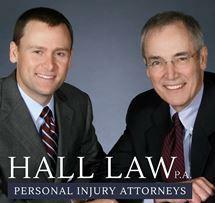 The personal injury attorneys at Hall Law are experts in car accident cases. The personal injury attorneys at Hall Law have extensive experience handling a variety of product liability cases. The lawyers at Hall Law are experts in handling death accident cases. In past years, studies have shown that more than 9,000 people die and 50,000 are injured annually in vehicle rollover accidents.